Poros is a verdant village on the southeast side of the island, surrounded by mount Atros and mount Pahni. It used to be one of the first villages on Kefalonia to welcome organised tourism in the early 80s, but since the late nineties and until present day the resort of Skala has become the main tourist attraction of the area. However, Poros remains a working port which links Kefalonia to mainland Greece and the neighbouring islands. If you would like to avoid package holidays and experience a more genuine Greek lifestyle, Poros is the best place on Kefalonia for independent travellers. The location is ideal for island-hopping, walking and hiking as well as for more slow-paced holidays in affordable prices. The village is divided into three bays. The central bay is where the main square and Poros port are located. 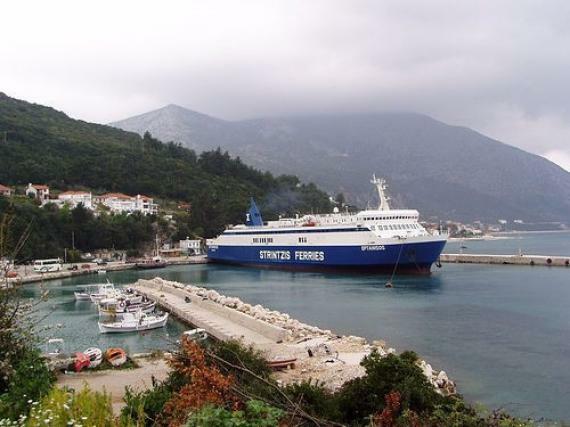 Within a walking distance is the extension of the port which was more recently constructed in order for Poros port to be able to welcome two ferries at the same time. Poros port is also preferable by many visiting yachts whose owners are seeking some privacy and a safe port to moor. All the isolated beaches of the area which are accessible only by boat, like for instance Koutsoupia beach, can be reached from Poros either by private yachts or by rented boats and organised tours. The islands of Ithaca and Zakynthos are also in a short distance and therefore if you are into island-hopping, Poros is your starting point. On the other hand, if you prefer to stay in Poros, you can enjoy superb views of Ithaca while having a meal in one of the 'tavernas' located both on the old and the new harbour. During the day, you can run all your errands in the shops of Poros while for the night time you can enjoy a refreshing cocktail or drink in the local bars. Vivid nightlife with clubs playing loud music is something you won’t find in Poros since the place has different things to offer, such as serene landscapes and peaceful atmosphere. The lively clubs of Argostoli are around 40 kilometres away whereas the popular resort of Skala is very close, if you choose to have a crazier night out. The beaches of Poros are covered with sand and small colourful pebbles. There are basic facilities such as a few sun loungers and umbrellas, but they are unspoilt and quiet. What’s better for couples of all ages than a serene beach nearby a picturesque village with all sorts of accommodation! The lovely beach of Aragia or Ragia which has been awarded with the blue flag several times is near Poros, while the entire coast from Skala towards Poros and from Poros all the way up to Fiscardo is full of sea caves –the natural habitat of the rare monk seals. If these animals choose these beaches to give birth to their babies, you won’t need to have any doubts about how clean they are! Even though nowadays Poros is a sleepy fishing village, in the ancient times Poros used to be one of the four most important towns of Kefalonia. In the area, there have been discovered the remains of the ancient citadel and a Mycenaean vaulted tomb near Tzanata village. Just above the port is one of the most renowned natural sights of Kefalonia, the Drakaina Cave whereas just off the beach there are a number of large rocks which were allegedly thrown by the Cyclops at pirates who were attacking the island. The old Atros Monastery dating back to 800 AD is also located in the area of Poros. Kefalonia is one of the Greek islands which combines natural beauty and tourist facilities while remaining truly unspoilt. Poros is the epitome of this philosophy and is waiting for you to enjoy relaxed holidays in a serene atmosphere! Find information about selected Hotels, apartments and rooms in Poros to choose the perfect place for your accommodation.